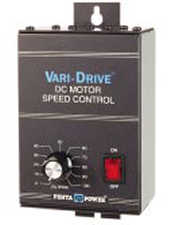 The KBWM™ Series Vari-Drive™ DC drives by KB Electronics has a NEMA-1 aluminum enclosure with two models available from 1/100 thru 3/4 horsepower. These drives are powered using the KBMM™ SCR control. And though the horsepower is limited by its size, these still provide all the flexibility of the KBMD Multi-Drive. Model KBWM-120 can handle 115 VAC input and is rated 1/100 thru 1/3 horsepower at 90 VDC. Model KBWM-240 can handle motors that are rated 1/50 thru 3/4 horsepower at 180 VDC. KBWM™ drives feature KB’s exclusive Plug-in Horsepower Resistor®)*, which automatically presets the drive’s IR Comp and CL circuits for safe operation on various motors. The KBWM™ internal trimpots can be fine tuned for specific applications for Min, Max, IR, CL, Accel and Decel although the settings are calibrated in the factory. The patented ultra-fast Direct-Fed™ current limit circuit eliminates motor failure that can be caused by demagnetization. These drives also feature Auto-Inhibit®, which allows the drive to be turned on and off rapidly using the AC line without damage to the control or motor.